As much as I’ve written about how you shouldn’t use a smart phone for backcountry navigation, and about the general problem of running down the battery and exposing it to cold and wet conditions, under certain circumstances they are an advatage. One of these advantages could be for SAR work. Why would I recommend smart phones for SAR work and not for general backcountry enthusiasts? Firstly, SAR members are usually sent on a task in a team of two or three, and a modern SAR team regularly equips each member with a radio. This mean each team of SAR members has multiple phone and radio links to base. Secondly, many SAR tasks, such as the one we did last weekend, are for a defined period of time, and not an extended hike in the wilderness. Finally, SAR teams have support in the form of helicopters, ATVs, and other teams that can provide communications and resupply. We’re not in the same situation as small group of hikers or mountaineers; we don’t usually require rescue. Another consideration, which I recommend to all backcountry users, is that SAR members usually have purpose-built backcountry GPS units. The smart phone is not being used to navigate (usually), which leaves it free for… well for what? The search I managed last weekend was a “scheduled” search for a subject who had been missing for a long time, and was likely either deceased, or not in the search area. I sent teams to search an area on a trail. One of the members had downloaded an application called Theodolite to their iPhone (similar applications exist for Android and Blackberry. 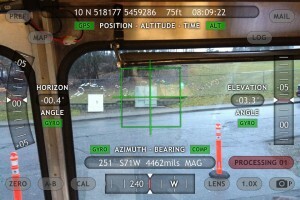 An actual theodolite is a device used by surveyors to measure angles of yaw, pitch and tilt — in the context of geographic data, the application displays the compass direction, geographic location (UTM or Lat/Lon), and other information directly on the screen, overlaid on the image coming from the camera. An example is below. The members of this team sent several images from various places as they completed their search. None of the images are particularly interesting, but the ability for the searchers to send images with date, time, location, and compass bearing written directly on them could be valuable in different circumstances. Having a data connection in the field and in the command vehicle is necessary for this kind of system to work of course. This isn’t well known, but iPhones and many other smart phones are capable of geocoding any picture they take. The geographic coordinates are encoded into the image. Unfortunately, you need special software to decode the data from the image to make it human readable. 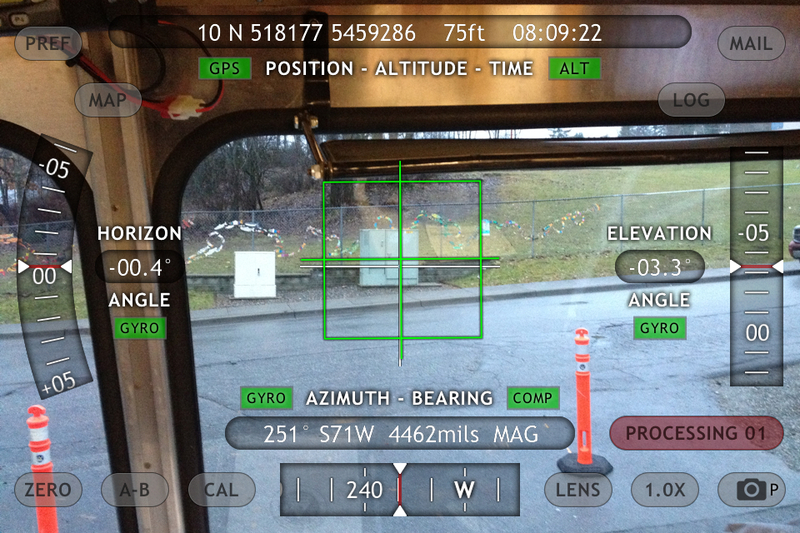 The advantage of the Theodolite app is that the coordinates are human readable, as is the direction the camera is facing. Note that the estimated accuracy of the GPS is also displayed (in this image it says 75ft). Most of the rest of the information on the screen is completely useless! Having SAR members equipped with audio and video recording equipment isn’t normally required, but there are a few circumstances where it’s very useful. One of these is when we’re involved in an evidence search — local police sometimes ask SAR to assist searching for evidence in a crime. Another instance where video could be useful is when we find a deceased person. While still images are good for documenting the location of a clue, video is much better at recording the context of how items are situated relative to each other. Several years ago I witnessed an RCMP officer use a still/video camera in just this manner when documenting the scene of a backcountry accident that resulted in a death. The officer, myself and another SAR member were sent in to a precarious and inaccessible location to retrieve the body. Since it was unlikely that we would ever be able to get into the area again,it was important to document the scene as completely as possible. The officer also recorded the helicopter approach and departure for completeness. If any reader knows of a good solution to stream live video from the field I would be interested to hear about it. As I wrote in my previous article, the biggest battery drains in a smart phone are the cellular radio, followed by the device’s screen. The GPS receiver by comparison does not draw much power. Using an application to log your track as you search shouldn’t draw too much power, as long as you keep it in your pocket. SAR members could use email to send their track data to the command centre rather than physically bringing their GPS device to have the data downloaded. There are a few applications I know of that just record track data; one is My Tracks (Android), and the other is AntiMap Log (Android/ iPhone). There are many applications that can record tracks, but include too many other features, such as map downloading, that would likely drain the battery since that makes significant use of the cellular radio. My only criticism of these track loggers, which is the same for all GPS devices, is this; logging a track and not logging the estimated accuracy of the data turns the application from a scientific instrument to a sort of toy. If such a track is displayed on a SAR planning map there would be no way to tell how accurate the track is, which is important when deciding whether an area has been properly searched. As an example, while using an Android phone on an urban trail recently, the GPS told me with great certainty that I was 5 kilometres from where I actually was. The biggest issue with this was that it claimed that it knew to within 200m where I was. So not only was the device wrong in determining the position, it was even more wrong in determining the accuracy. Having rescued many people with smart phones, I tend to ask them if they could determine their position by using the map on the phone. Most of the time I get one of two answers: first, the phone’s battery is dead, or second, the GPS showed them far away from where they thought they were, and kept jumping around (a symptom of a bad GPS fix). One final thought about how SAR members can use smart phones involved the ability to access the internet and look up information. Another example I witnessed was when a subject told us a drug they had been prescribed, a member of my team who is also a registered nurse was able to look up the drug and find out more information on it’s physiological effects on the patient. Given how useful the smart phone has become, and that SAR members regularly use them in the wilderness, how should we protect them so they work when the weather is cold and wet? There’s lots of protective cases out there. If any reader has a particularly good suggestion on what case works well in the wilderness, please reply below. What do you use to protect your smart phone day-to-day and in the great outdoors? That’s a good point about the cameras with GPS. I still like the “HUD” (Heads Up Display), and the fact that the compass bearing is also recorded. Good points, Mike. However, I think that app has a bug. UTM zone 10N is near the equator, and it doesn’t jive with the northing, which is far from the equator. You’re in 10U. I looked into this, as I found it hard to believe that the app (which I wrote about several years ago) was wrong and here is what I found. The letter designators, also known as “Latitude Bands” are not actually part of the UTM system – they are a convention borrowed from MGRS. The “northing” in UTM is the number of metres from the equator, so the “N” in the coordinate displayed is indicating a northern hemisphere UTM Coordinate in zone 10. This is very confusing because, as you pointed out, there is an “N” Latitude band as well. Similarly if you were trying to write a southern UTM coordinate and used “S” you could be referring to the latitude band “S” or just the entire southern hemisphere. Now I’ll be the first to state that this makes no sense, and you should always include the latitude band, or letter designator, when giving a coordinate. Thanks for pointing this out, which required me to read about it, and learn something new about UTM.